(Nanowerk Spotlight) Despite their name, carbon nanotubes (CNTs) are not made of 100% carbon. Depending on which of the various synthesis techniques is used in their production, CNTs have variable chemistries and physical properties resulting from their different metal catalysts or amorphous carbon coatings. As a result, they may contain large percentages of metal and carbonaceous impurities which will have different environmental and toxicological impacts. In early toxicological studies, researchers obtained confounding results - in some studies nanotubes were toxic; in others, they were not. The apparent contradictions were actually a result of the materials that the researchers were using, not appreciating that 'carbon nanotubes' are really 'carbon nanotubes + metal + amorphous impurities'. Ignoring these impurities prohibits scientists from fully understanding the material's electronic character, environmental transport, transformation, and ecotoxicology. More recently, scientists have begun to acknowledge that the identity of these impurities and co-products is critical to CNTs' toxicology and chemical behavior. However, the chemical compositions of these fractions are not well defined and there have been no concerted efforts to identify and compile this information - without which accurate environmental risk assessments for specific CNT stocks is not possible. To address these needs, a group of researchers measured the elemental, molecular, and stable carbon isotope compositions of commercially available single-walled carbon nanotubes (SWCNTs) produced by ten companies in the United States, giving a true picture of their diversity and chemical complexity. This diversity and complexity is extremely important from both fate and toxicity perspectives. Other CNT analytical methods can only be used with relatively pure samples, and current environmental techniques rely on electron microscopy – which is very tedious and time consuming – to detect CNTs. "Our specific goals were to 1) identify metal catalysts and aromatic hydrocarbons that would be released with and affect the properties of SWCNTs, 2) seek compositional data suited to pursuing environmental exposure modeling of SWCNTs, and 3) find properties that would be helpful for detecting, and perhaps apportioning the sources of, SWCNTs in environmental matrices" Desirée Plata tells Nanowerk. "If we are going to predict the toxicities of nanomaterials, we need to know what they contain and understand how those components vary – e.g., are they always 15% nickel and 5% yttrium? Do they all have hydrocarbon contaminants that may desorb in the environment?" Plata, a joint program graduate student at MIT and the Woods Hole Oceanographic Institution (WHOI) and her mentors, chemists Phil Gschwend and Chris Reddy, found that the ten different carbon nanotubes had vastly different compositions. The scientists reported their results in the April 2, 2008 online edition of Nanotechnology (Industrially synthesized single-walled carbon nanotubes: compositional data for users, environmental risk assessments, and source apportionment). This study is the first time that anyone has explored the use of carbon isotopes or metal ratios to track carbon nanotubes in the environment. Both of these analytical methods can be used to detect nanotubes in bulk samples (e.g., in sediments or aerosols), allowing for high-throughput quantification of carbon nanotubes in complex matrices. 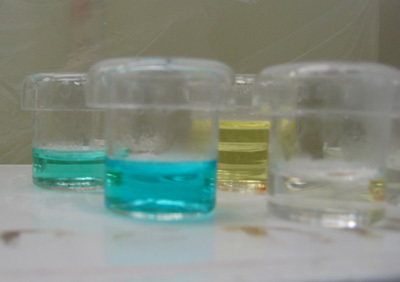 The results show that the metals associated with carbon nanotubes are available for reactions with the outside world. "Many people suspected that they would not present a true danger, since they would not be free to react with or travel to the environment" says Plata. "Since that is not the case, we need to adjust the way we account for nanotube toxicity, reactivity, and potential environmental effects." Plata and her collaborators think that the most concerning problem is the reactivity of the metal catalysts that travel with the CNTs. There are many approaches to try to minimize this effect, and probably the most effective approach, until we know more, will be to embed the materials inside of impermeable layers such as polymer matrices (which is used for instance in consumer products such as CNT-reinforced golf balls or tennis rackets). "If a manufacturer chooses to use CNTs in clothes, sunscreens, water-filtration devices, or permeable reactive barriers (to treat ground water), they may be assuming an unintended risk to the public and the environment" says Plata. This of course is the challenge that regulators are facing today: you can't regulate a toxin or tell if it is sitting in your backyard if you don't know how to find it in the first place or, even if you find it, don't know exactly what its effects are. Rather than modeling the risk of a generic, i.e., over-simplified, SWCNT, researchers need to develop nanomaterial risk assessment methods that take into account the actual diversity of these products and their interaction with the environment. This might lead to mathematical models relating certain CNT parameters to various degrees of toxicity. Plata says that the research community is moving towards being able to track these diverse chemicals which will help to develop sound analytical techniques. This will also enable manufacturers to weigh the material-specific risk assessments and design synthetic processes to achieve environmental objectives while simultaneously considering performance and manufacturing cost. An interesting side result from this research is that the unique metal ratios can be used to 'fingerprint' CNTs. The researchers note that, for example, in Houston there are several CNT manufacturers. If there were a release of CNTs to the environment, it would be possible to tell which manufacturer was responsible for the release based on the metal content of the nanotubes. The city of Houston could then identify a 'responsible party' and ask them to assist with the clean up. The good news from research like this one of course is that it is taking place before a real problem pops up. This represents a big paradigm shift from the way some sectors of industry and society used (and use) to operate, i.e., pollute first, then worry about it later when it becomes a problem. If the emerging nanotechnology-based companies act responsible (and smart), they will fully embrace being asked challenging product safety questions and they will proactively support finding all the required scientific answers so that they can become an integral part during the design of new industrial processes and materials. Plata says that, in a way, this is what environmental champions have been demanding since the 60s. "Rachel Carson wanted people to use DDT in a smart, indiscriminate way. She was against the ubiquitous distribution of poorly understood chemicals. Essentially, we're calling for the same type of action: use these chemicals, but use them in a smart way from start to finish. The old adage, 'it's easier to beg forgiveness than ask permission' doesn't apply to mother nature and it doesn't apply with public health. We need to be proactive about preventing future environmental catastrophes, and we have the means to do it." In previous work (Helping The Carbon Nanotube Industry Avoid Mega-Mistakes Of The Past), Plata and colleagues found that the process of nanotube manufacturing produced emissions of at least 15 aromatic hydrocarbons, including four different kinds of toxic polycyclic aromatic hydrocarbons (PAHs) similar to those found in cigarette smoke and automobile tailpipe emissions. They also found that the process was largely inefficient: much of the raw carbon went unconsumed and was vented into the atmosphere. The researchers are currently working with materials scientists and industry to mitigate these effects.